This is an in-store event. To receive a number for the signing line purchase a copy of the author's latest book from Anderson's Bookshop. Thanks! Thursday, August 29, 5:00 p.m.
Great news! Best selling and much beloved author/illustrator, Patricia Polacco, brings us her new book, The Blessing Cup. This tender tribute to the importance of loving lineage is a prequel and companion to the perennial bestseller The Keeping Quilt and is told and illustrated with authenticity and tremendous heart. We couldn't be more excited! As a young Russian Jewish girl in the early 1900s, Anna and her family lived in fear of the Czar’s soldiers. The family lived a hard life and had few possessions—their treasure was a beautiful china tea set. When Anna’s family leaves Russia for America, they bring the tea set and its blessings. Patricia Polacco has a special place in her heart and soul for teachers and librarians. After appearing at Hicklebee's on Saturday, August 24, she will return for a special reception just for educators. She'll have her newest book The Blessing Cup to share. The Blessing Cup chronicles her family's journey from Russia to America and is a companion to The Keeping Quilt which was published and launched at Hicklebee's 25 years ago. All educators are welcome. Please RSVP here or call the store at 408.292.8880. Let us know at which school you are employed. Twenty-five years ago, Patricia Polacco introduced The Keeping Quilt at Hicklebee's. She is returning to launch its companion title, The Blessing Cup -- Saturday, August 24 at 1:00. 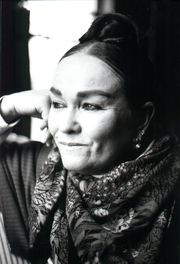 For information about the August 27th Educator's Reception with Patricia Polacco, click here. During these twenty-five years, Polacco has created some of our all time favorite titles, Thank You, Mr. Falker, Thunder Cake, Pink & Say and more recently Junkyard Wonders. We can't wait to have her among us once more. We'll be handing out numbers for your place in the signing line beginning at noon. Patricia Polacco will be presenting The Blessing Cup at 1:00, with the signing to follow. Click here for event guidelines. Come and meet the award-winning author and illustrator of beloved books such as Mrs. Katz and Tush, The Keeping Quilt, Babushka’s Doll, and many others. PATRICIA POLACCO promotes In Our Mothers' House. Patricia Polacco reads from In Our Mothers' House. Patricia Polacco is currently considered a "single author." If one or more works are by a distinct, homonymous authors, go ahead and split the author. Patricia Polacco is composed of 14 names. You can examine and separate out names.